“Shahira and the Flying Elfs” by Anna del C. Dye is one of several books written by this author on the topic of Elfs. Just reading how consistently and with such details she describes the Elfs, their strengths and weaknesses, their talents, their life style, and so on, one could almost believe she has actually spent time living with Elfs! This book is remarkably well written, and the story is an entertaining one. Shahira is an eaglet, one of the few remaining Old Ones, the Giant Eagles. She lives in the nest with her two parents and her younger brother. To Shahira’s distress, her brother can fly just fine, but she is unable to do anything except fall, whenever she tries jumping from the nest. The other Old Ones wanted her father, Huntan, to kill her when she was young, because there was something “different” about her. But Huntan naturally refused, and so lost his position as head of the Eagle Council. Still, as she grew it became more and more apparent that she was different, and her younger brother, Younty, despised her for all the extra attention her father bestowed upon her. If Shahira cannot fly, and is so obviously different from the rest of the Giant Eagles, what might she really be? The other eagles don’t want to know; they just want her gone. In an effort to save her from the dangerous subterfuge being considered among the other eagles, Huntan scouts a party of Elfs returning from assisting a wagon train of she-humans who had been set upon by the predatory Orks. 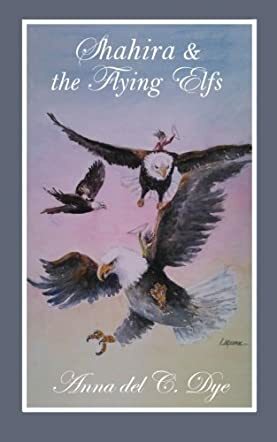 Deciding which of the Elfs might be able to help him, he swooped down and snatched him from the ground, flying him back to the nest, where he dropped him next to Shahira. Much, much action and adventure ensue, involving wizards, both good and bad, Elvin selflessness, Giant Eagle cooperation and hindrance, Magic, and too many twists as well. “Shahira and the Flying Elfs” is more like a historical record than a novel. This story will change your perception of Elfs, whatever that perception now may be. If you have a penchant for reading Fantasy, you must read this book. It is a definite winner.